The first file I peered inside had the video FourCC ‘RRV1’. Searching for this led me to this discussion forum where people have already been hacking on this very format (Origin games invariably get a heap of lasting love). The forum participants have observed that 3 codecs are in play in this flics/ directory, including ‘RRV1’, ‘RRV2’, and ‘JYV1’, which apparently correspond to the initials of certain developers. The reason that the programs identify the files as raw RGB is because the FourCCs don’t appear everywhere that they’re supposed to. Additionally, there are several trailers for other Origin/EA games stored in Cinepak format elsewhere on the disc. It seems that I’m the person who added this title to the Xan wiki page, obviously with no first-hand evidence to back it up. Meanwhile, the forum participants speculate that the files are descended from the old Autodesk FLIC format (which would explain why they live in a directory called flics/). Corroborating strings extracted from the CRUSADER.EXE file include “FlicWait”, “FlicPlayer”, “Flic %s not found.”, “flicpath”, and “FLICPLAY.C”. 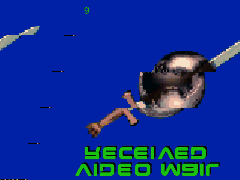 The disc also features a sound/ directory which contains AMF files. Suxen Drol already documented these on the wiki as Asylum Media Format files. 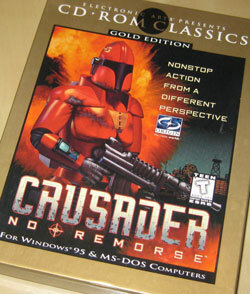 The disc contains an ASYLUM.DLL file as well as a utility called MOD2AMF.EXE. The latter works beautifully on a random MOD file I had laying around. The AMF file is a bit larger. Samples for all 3 FourCCs can be found here, while the AMF files and associated utilities are here.